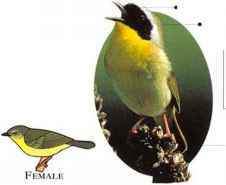 I ypically a bird of reeds and tall grasses, the Yellowthroat often moves with its tail tilted upwards, like that of a wren. 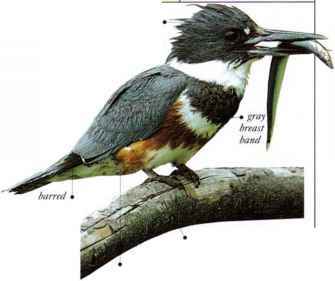 It also inhabits thickets, shrubs, and marsh vegetation. The diet consists of small insects. • NliST A cup-shaped nest of grass and bark fragments, lined with finer material, and placed on or near the ground. • Distribution breeds in S. Canada, much of USA, and Mexico. Winters in S. USA, Central America, Colombia, and Venezuela. 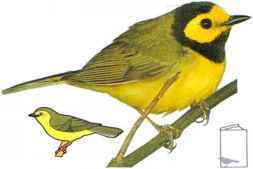 A bird of swampy woodland and scrub, the Hooded Warbler usually stays hidden in low vegetation. 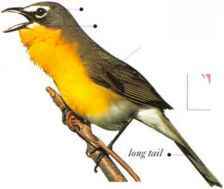 It has a habit of (licking open its tail feathers as it searches for insects. • NliST A grass and leaf cup, lined with finer grass, and hidden in thick vegetation on the ground. Breeds in K. USA. Winters in Central America, N. Colombia, distribution and N. Venezuela. Female white "spectacles"